The 1909 Buckingham Murders: Part VII | slate river ramblings . . . .
Former Buckingham County Judge Alexander S. Hall with Aubrey E. Strode and John L. Lee of Lynchburg were chosen to represent Dallas Wright. The prosecution was headed by Commonweath’s Attorney Edmund W. Hubard, assisted by Frank C. Moon of Snowden (Buckingham County) and Lynchburg. In addition to his law practice, Moon was a former State Senator. According to The Times-Dispatch, Senator Sands Gayle was “retained by citizens to aid the prosecution” and Congressman H.D. Flood and his law firm were also employed by the State Bureau of Insurance to further assist the prosecution. 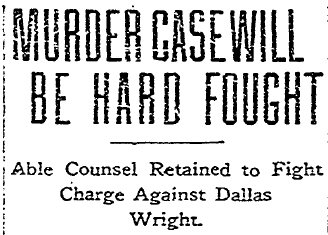 In anticipation of Wright’s trial, it was reported that his brother, Clifford, asserted that he slept in the same bed with Dallas on the night of the crime. Their mother was also in the house that night and could have provided her son with an alibi; however, Mrs. Wright had died in May, leaving Clifford the only living witness to Dallas’ whereabouts.
. . . [Wright] lived near the log cabin home of the Stewarts and had known them perhaps all his life, and he stoutly maintains that he was in no way connected with the triple crime of murder, robbery and arson with which he is charged, and his relatives have made sacrifices to secure counsel for his defense. Could an unbiased jury be found in Buckingham County? Could Dallas Wright receive a fair trial without a change of venue? Attorneys Hall, Strode, and Lee had their doubts. ← The 1909 Buckingham Murders: EXTRA!